What are the Best Dental Implant Options for Older Americans? Home › Fix My Smile › What are the Best Dental Implant Options for Older Americans? Products nowadays are almost expected to be easily replaceable. Everything we use, from our cars to our phones, is meant to last us a handful of years at best and then be quickly replaced for the latest and greatest model. When it comes to dental care, however, one of the best means of improving oral health is through permanent solutions, such as dental implants. There are plenty of choices out there, so what makes for the best dental implant options for older Americans? When comparing dental implant options, it’s important to consider that this is a solution that should last the rest of your life, so you want to get your money’s worth with a cost-efficient choice. The dental implants should be made from a strong, reliable material to best stand up to the everyday wear and tear that comes from eating and talking, while remaining comfortable. The very best dental implant options for older Americans should also be as lifelike as possible, for the most natural looking smile. This may seem like a lot to ask out of a set of dental implants, but that’s what makes Teeth Tomorrow® the best dental implant option available! The strength of every Teeth Tomorrow® full-arch dental implant bridge lies in its building material – the truly wondrous and space-age Prettau® Zirconia. Prettau® Zirconia is the superior material for dental implants, as it never chips or cracks, while also remaining resistant to harmful and foul-smelling bacteria. Each Prettau® Zirconia implant bridge is custom-milled with your specifications in mind, for a smile that is as lifelike and comfortable as your natural teeth! 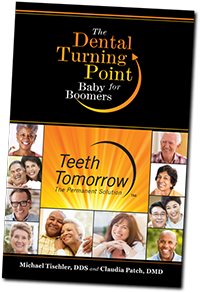 If you’re one of the millions of older Americans who have reached their dental turning point, Teeth Tomorrow® represents a truly permanent solution to all your dental problems. The pain and shame stemming from a mouthful of missing and failing teeth are a thing of the past, thanks to the proven success of every Prettau® Zirconia full-arch dental implant bridge! You can enjoy all your favorite foods again, you can talk and smile with confidence, and you can rest easy knowing that your new teeth are built to handle anything life throws at you. Your dental problems can end today with Teeth Tomorrow®, contact Dr. Michael Tischler for your initial consultation! Why is the Bridge to Tomorrow Better than other Lower Cost Procedures? What is the Teeth Tomorrow Bridge to Tomorrow? Why Are Dental Implants Better Than Dentures?